Stretch marks are narrow, long lines on the skin, which can occur mostly in abdomen, thighs, hips, breasts etc. The causes behind stretch marks include rapid weight gain, weight loss, puberty etc. Though they are not dangerous to your health, they may create problems with anxiety and self-image. But don’t feel anxious. There is a solution for stretch marks. Yes, an easy remedy is vitamin E oil. Vitamin E nourishes our skin and is really effective for stretch marks. Let’s discuss in this article how to use vitamin E oil for stretch marks. Is Vitamin E oil Good for Stretch Marks? Can I Use Vitamin E oil During Pregnancy? How to Use Vitamin E oil for Stretch Marks? How Long Does it take for Vitamin E oil to Work on Stretch Marks? Undoubtedly, vitamin E oil is good for stretch marks. According to a doctor of Mayo Clinic, if vitamin E oil can be applied to skin, then it can avoid stretch marks as vitamin e oil increases collagen production, it makes skin elastic. Therefore, skin becomes less susceptible to stretch marks. You must use vitamin E oil during pregnancy for preventing stretch marks on the skin. 50-90% pregnant women develop stretch marks on the skin. Vitamin E oil is safe for use during pregnancy and has no side effects. In few cases, it may cause a mild allergic reaction. In that case, you must stop using vitamin e oil and contact your doctor. Vitamin E oil contains essential fatty acids and nutrients. Therefore, it prevents stretch marks. 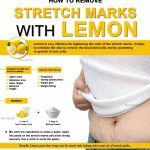 It can be applied directly to the affected areas or it can be combined with other ingredients before applying to stretch marks. 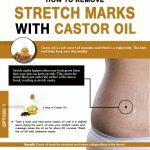 Castor oil has antibacterial property, which prevents stretch marks. It moisturizes the skin. It boosts collagen production and enhances elasticity of the skin. How it works: this mixture enhances the elasticity of the stretched skin. It penetrates deep into the skin and acts as a moisturizer. Thus, it removes scars. Cocoa butter has healing properties because it acts as a moisturizer. It improves the elasticity of the skin. Thus it heals stretch marks. How it works: this mixture penetrates deep into the skin and acts as a moisturizer. It boosts immune system and collagen production. Aloe vera, rich in nutrients, relieves the skin from stretch marks. It repairs damaged skin and lessens the stretch marks. How it works: this mixture has healing property. It moisturizes the skin and removes stretch marks from the skin. Coconut oil is a natural moisturizer and is effective for stretch marks. Its anti fungal property kills germs on stretch marks. Mix coconut oil with vitamin E oil. Apply it to stretch marks. How it works: the saturated fats in coconut oil moisturize the skin. It has antioxidant properties. It is rich in vitamin E and vitamin K, which remove damaged cells and lessen stretch marks. Best time to apply: before going to bed, after bath. Antioxidants in olive oil neutralize damaging elements. Besides, olive oil has linoleic acid, which prevents water evaporation from the skin. Thus, it reduces stretch marks. How it works: this mixture is a good natural moisturizer. It is a rich source of antioxidants, which removes stretch marks. Best time to apply: before bath, before sleep at night. Almond oil is effective for stretch marks and it helps to tone your skin. It improves skin texture and boosts collagen formation, which lessens stretch marks. How it works: its anti-inflammatory property reduces inflammation and its regenerative property helps to renovate elasticity of the skin. Thus it removes stretch marks. Best time to apply: after bath, before sleep at night. It soothes and moisturizes the skin. It is actually formulated for baby’s soft skin. But it can be applied to stretch marks also. How it works: it softens and soothes the skin especially baby’s skin. As it has moisturizing property, it penetrates deep into the skin and nourishes skin. Thus it lessens stretch marks. There are a number of vitamin E products that are used to remove stretch marks. Before purchasing any product, you must consider its benefits, quality, features etc. here are reviews of 5 best vitamin e oils. This product has 8.5 ounces vitamin E oil, which has antioxidant property. This product is natural as well as has high quality materials and color-free chemicals. Daily use of this oil will make your skin soft and free from stretch marks. This product is 100% pure. It is natural and organic and has antioxidant property. It is made from wheat germ. It not only softens skin, but also prevents stretch marks. This product acts as a moisturizer. It has multiple usages- it can be taken orally and it can be applied topically. It promotes immune system, softens the body and removes stretch marks. This product is made from nuts, coconut oil. It is rich in vitamin e and vitamin C. it is one of the best products, which can heal scars, stretch marks, dark spot. It even protects the skin from ultraviolet rays. This oil nourishes our skin because it is made from natural ingredients. It is not composed of any extra chemicals like artificial colors. It softens the body as it is antioxidant in nature. Vitamin E should be applied to skin before pregnancy so that it can prevent its appearance. During pregnancy, due to rapid weight gain, we can see stretch marks. So you must apply vitamin E oil during pregnancy. After pregnancy for 4 weeks, if you apply it, then stretch marks will be reduced. Bear in mind, only topical application of vitamin e oil can’t prevent stretch marks. In addition, regular exercise and balanced diet are needed to check rapid weight gain, which causes stretch marks. During pregnancy, try to gain weight slowly. Don’t get frustrated with stretch marks because it disappears or fades away as time passes. How To Use Almond Oil for Stretch Marks? How to Use Cocoa Butter to Get Rid Of Stretch Marks Fast? 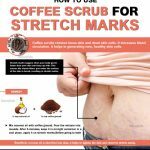 How to Use Baking Soda for Stretch Marks? 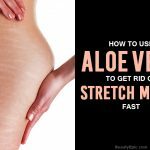 Can Aloe Vera Help Stretch Marks? Vitamin E nourishes our skin and is really effective for stretch marks. 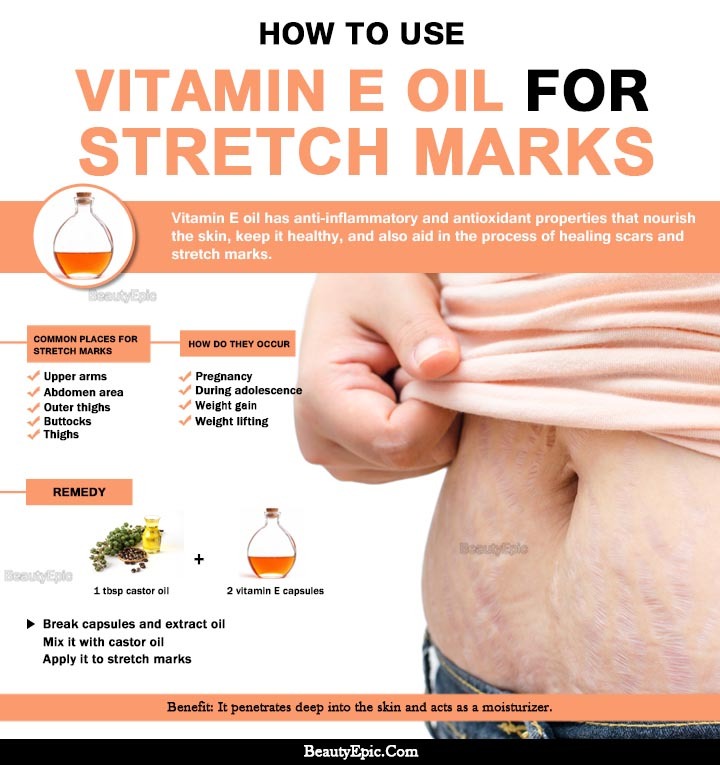 Let’s discuss in this article how to use vitamin E oil for stretch marks.